This is a peel-off mask with activated charcoal, meant to clear your pores (specifically just for your t-zone area). I think it’s meant to be like a Biore pore strip but peel-off. I am all about this concept. A pore strip without the amount of waste the fabric ones use up? Yes, please! Unfortunately, I do not love this product. It did not come off in one cohesive layer. It took a very long time to dry, and even then I had to peel off bits and pieces. I ended up washing off the last bits. Also to note: this may likely bother sensitive skin, based on notes from their website and reviews on their product page. You had me at coconut and fig. What a heavenly fragrance combination. I used this this morning, and I like it! I don’t know if it was life changing but it’s a very nice conditioning treatment and smells so good. I will say that the instructions are odd. They say to shampoo, and then apply this to towel-dried hair, leave on for 5-10 minutes, and rinse. I assume they just mean to squeeze out extra water from your hair after shampooing in the shower? Because that’s what I did. Who are these people who are washing their hair, getting out, towel-drying, sitting around wet and naked for 5-10 minutes, and then getting back in the shower, all for this mask? I’m not sure, but it definitely worked just fine for me without formally towel-drying. Listen to my words: As I am writing this review, it is -11 in Michigan, with wind chills making it feel like -50 degrees. The town I live in is very literally colder than the South Pole at the moment. All of my skin is dry. My face, hands, elbows… all of me is so dry. But! Not my lips. Not with this. I have to admit, I’m generally not the biggest fan of all the Manna Kadar I get across my various beauty subscriptions. But this lip oil is so nice – it sort of feels like a gloss but there is zero stickiness. It goes on a little thick and so smooth, and feels great. This oil has a subtle pink tint, which really makes this something I feel I can wear by itself during the day. You can also add this over a lip color. I am actually a big fan of this and will definitely consider buying a full size once this sample is used up. I never go without a leave-in treatment or detangler of some kind after showering. This is a cute bottle, especially for traveling, and the formula works well, too! It smells nice, detangled my hair well, and left my hair feeling soft after drying. This brand is new to me, but it’s pretty good. I don’t think it’s amazing but it coated my lashes well without clumping. I do like the light blue and silver packaging, though! Here, I’m wearing the mascara and the lip oil! Verdict: My January box was a pretty good month for me from Birchbox! I really like everything, except the mask, and will use up everything else in my box. The estimated value total adds up to $30.26 – a great value from a $10 sample box! What do you think of my January Birchbox? Did you pick a curated box or a sample? Fellow Michigander here. 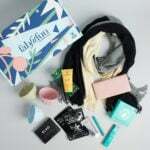 Just signed up for my first Birchbox…and sure hope that lip oil is included! I got the same hair mask in my ipsy a couple months back and I was wondering the same thing but I haven’t tried their crazy directions yet either lol who does that? Amen to the weird instructions, definitely had the same thought! Also, your lashes look BOMB with that mascara! Wow! Regarding the hair mask instructions of leaving it in for 5-10 minutes, I’ve received a lot of hair masks with those instructions, and typically after shampooing my hair (which is the first thing I do in the shower), I apply the hair mask, then do my other shower duties that typically can take that amount of time, then I rinse out the mask at the very end. I never towel dry my hair first though (although I could see how someone could quickly do that before applying the mask), but rather I also just squeeze out the water, then apply the mask. However, I know the less amount of water you have in your hair, the more effective the mask will be, which is probably why they put those in the instructions. Great box!! I’ve not had great experiences with peel off masks in the past but was curious about that Blaq one….glad to see I’m not missing out haha. Your lashes look great!! I received the Beautiniq blush serum in my box and thought I’d hate it but actually think it is super pretty as long as it is blended well. Same here!! A good chuckle at work. I received the hair mask too and haven’t used it since the logistics didn’t really sound appealing, but I’ll try this method now! Yes, me too. And that is what I thought when I read the directions, so I haven’t tried it yet, but I will just follow what you did because I really want to try it.